Ghosts haunt Wadmalaw Island, including the new home of Liv and Autis Oakley. The couple bought what they thought was their dream house, only to learn that no one else dared to live there. 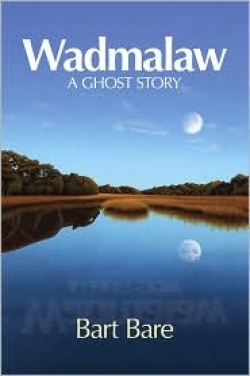 This complex tale told by Bart Bare in Wadmalaw weaves together Civil War and slave history with the folklore of the very real Wadmalaw Island, in South Carolina. Bare’s rousing ghost story is a winner on every level and some of the most beguiling characters never become flesh and blood. The apparitions that evolve from faintly heard voices in the basement of the Oakley’s house to a black panther that can kill (but cannot itself be killed) jump off the page to linger in the reader’s memory. Liv, it turns out, is the descendant of an illicit union between the daughter of a plantation owner and a slave who is actually the daughter’s half-brother. She learns of her complex ties to the African-American population on Wadmalaw through Miz Sweet, an elderly black woman who knows the family history and welcomes Liv and her husband into the fold. But all is not sweetness and light. The ghosts who haunt the Oakley house and lands are capable of doing great harm and violence. Before it is finally dealt with, for example, the panther will claim the lives. As Liv and Autis adjust to the reality of the graves of slaves on their property, their assimilation into Liv’s newly discovered family members, and the ravages of the panther, the dangers grow. And the truth they uncover along the way shows many of the ugly realities of slave life prior to and during the Civil War. Before the end of the tale, Liv and Autis learn much about themselves and each other. There are occasional instances of awkwardness in the dialogue—overlong speeches and stilted phrasing—but the story itself commands the reader’s attention as it builds to a satisfying climax. Readers in search of a tale to raise the hackles will not be disappointed.